Stores can’t exist solely online or offline anymore, and long-term leases continue to grow more expensive. From this set of circumstances many brands, old and new, have used temporary retail pop-up stores to create interesting and interactive experiences for their customers. However, pop-up stores can be used for more than just selling products, they can also be used to engage with customers, educate them, and most importantly learn what they want. Create An Experience: One of the main concepts that come with pop-ups, on the customer-facing side, is the creation of an experience. Beyond a fun party with possibility of special guests, pop-ups allow customers to learn about a brand, and feel like they are “in the know.” For emerging designers or brands with only a cult following, customers are able feel like they have access to the brand before it gets even more popular. For established and larger brands, pop-ups can provide a highlight of new or particular products, provide hands-on in-depth education, or simply be a way to boost and reinforce the brands message and/or aesthetic. You need to bookmark chapter 6, “Focused Learning and Testing,” because this chapter explains that you can gain important data about your customers from a pop-up. Obviously, tracking products can tell you quantitative information – who bought what and when, and where they did. Tracking social media in conjunction can give you qualitative information namely, why they bought a product and what people are saying about your brand. Even if something doesn’t work or a pop-up ‘fails,’ having this type of information can help you figure out why certain things work allowing for a potentially more successful attempts afterwards. You’ll also want a highlighter for the third section of the book, “A quick A-to-Z of things to know about running a pop-up.” The section covers how to measure ROI, how to create buzz, and nearly everything you need to do from brainstorming ideas, to the day your pop-op opens to the public. Get Creative w/ Technology: Gonzalez is not just concerned with the here and now, she also has her eyes set on what will happen in the future. Things like augmented reality interfaces, which will allow you to learn more about product, even how it will look on you. There’s beacon technology, shoppable walls and even products printed on demand. Some of these ideas already exist. As exciting as this stuff sounds, Gonzalez warns that new technology can potentially scare off customers if not utilized with the customer in mind. 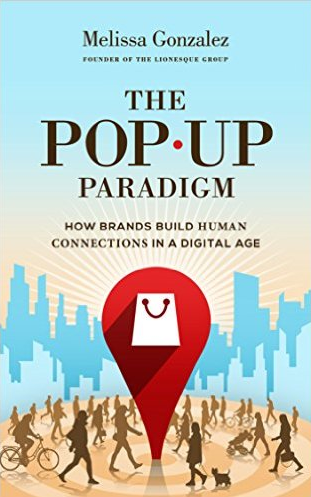 “The Pop-up Paradigm,” has examples of pop-up concepts and successes strewn throughout in order to give real credence to the ideas. Most of these are from examples of pop-ups that Gonzalez and the Lion’esque Group have worked on. We know firsthand that Gonzalez knows her stuff. At our latest Freestyle Fashion Conference in New York, she presented a live case study of a potential pop-up for a lucky brand that was in the audience. If you’re thinking of using a pop-op for your brand this book is a great primer. Of course, once you get a sense of what you want to accomplish, you should go right ahead contact the Lion’esque group.